The Microsoft Excel demo polls the noise levels from XL2 Analyzer each second, generates a time chart, bargraph and lists the log data. Just press ALT-F11 to view the code behind the Excel Application and change it to suit your solution. To obtain data from the XL2 Analyzer via USB requires that the Remote Measurement Option be installed on the XL2, enabling online querying of noise levels, the noise spectra and RMS/THD data directly to your PC. 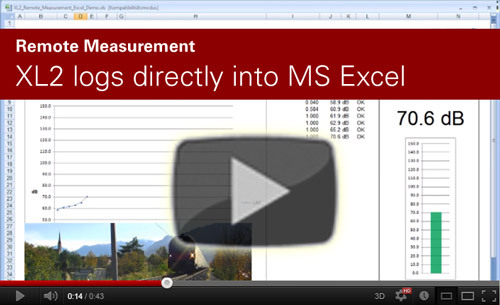 Watch the video "XL2 log directly into MS Excel"